In addition to my marble-top tulip table, white campaign nightstands have been on my ‘bucket list.’ For the past year, I scoured every antique show, flea market, vintage store and Craigslist post to no avail. They were always either way out of my budget, required too much TLC, or weren’t the right size. My bed is on the taller side, so I wanted something in the 28″ – 30″ range. I felt like the Little Red Riding Hood of nightstands! I couldn’t find anything that was just right. Enter Ave Home. Ave Home reproduces classic furniture pieces from various design periods ranging from French Louis XV to Mid Century Modern. Their AVE RAW line “focuses on a range of styles that speak to the DIYer or Designer who want high quality furniture for their own hand applied finishes at an affordable price.” Um, are they speaking directly to me!?!? As I started scrolling through their RAW collection, I spotted the Small Harper Campaign Dresser and basically about a died. It was the exact size I wanted, the exact price range I wanted, AND I could customize it however I wanted! It was almost too good to be true. But it was true, and now the dressers are mine. They arrived a couple of weeks later, and I couldn’t have been more excited to rip the boxes open. They were as perfect as I had imagined! They’re made out of unfinished mango wood and are pre-primed, which makes them perfect for DIY’ing. 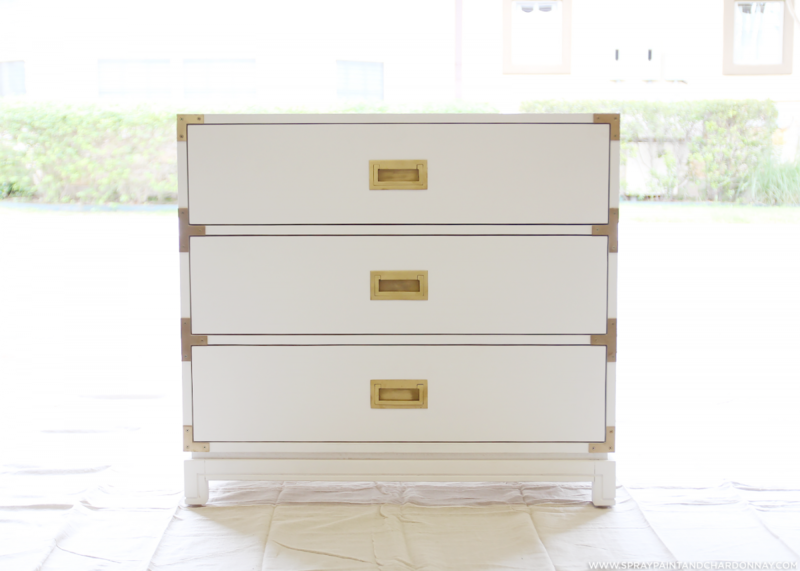 I planned to paint them a high-gloss white, and while in the picture above they already look white, you can still see a little of the woodgrain through the very matte primer, and they definitely needed a couple of coats of paint to achieve a glossier look. So, I got to painting! First, we removed all of the brass hardware and set it aside. I put everything in separate plastic baggies to keep it all together and to make sure I didn’t lose anything. Next, was the trickier part. While I like to think that I’ve mastered the art of spray painting, admittedly, I’m not all too familiar with using a paint sprayer. I found this one online, and it seemed to do the trick — after a little practice, that is! 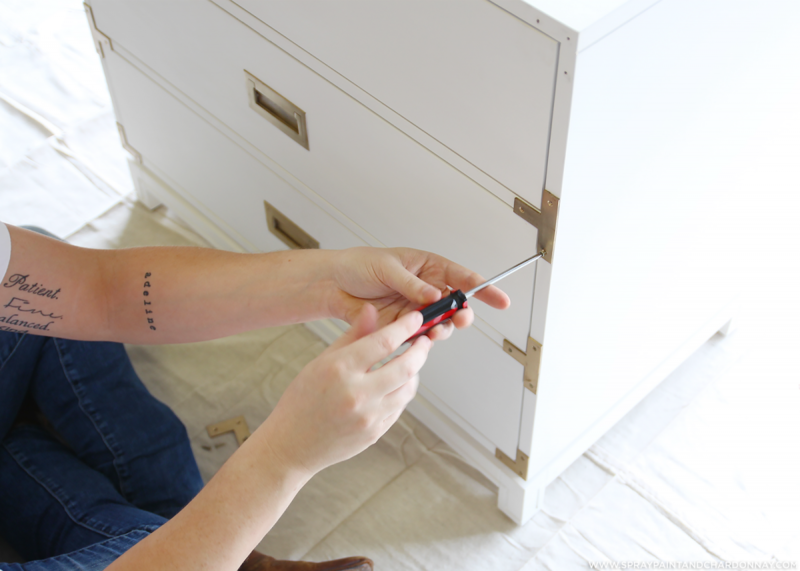 I knew I wanted a glossier finish, and the fine people at Sherwin Williams assured me that a semi-gloss oil-based paint would give me the finish I wanted and would stand up to the wear and tear of daily use. With a sprayer and oil-based paint, it’s important (and I didn’t know this!) to dilute the paint a bit with paint thinner to ensure an even spray. This took some testing, so I suggest having a piece of scrap wood nearby to practice on before spraying the real deal. 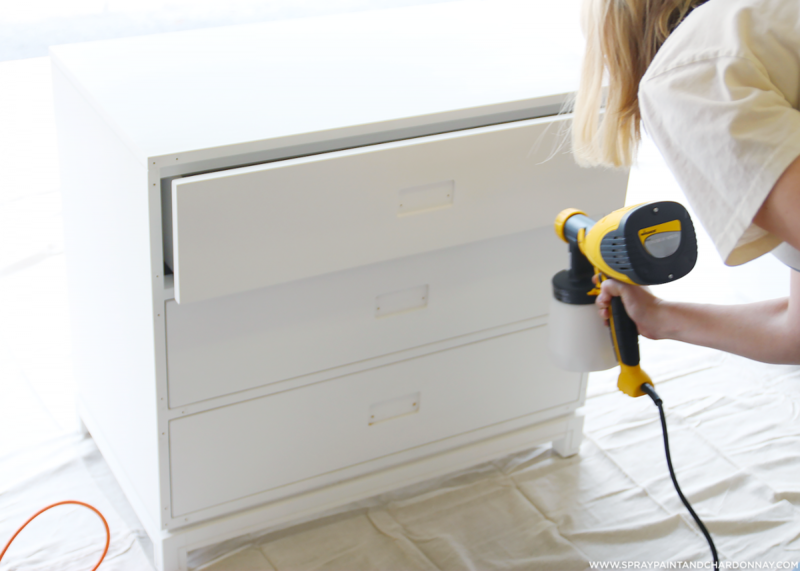 Once I got my sprayer and paint at the right consistency, I sprayed a couple of coats on the dressers and let them dry for a full 24-hours before handling. Oil-based paint takes about a week to fully “cure,” so I moved the dressers into my guest room, out of the way, so that they could completely dry. 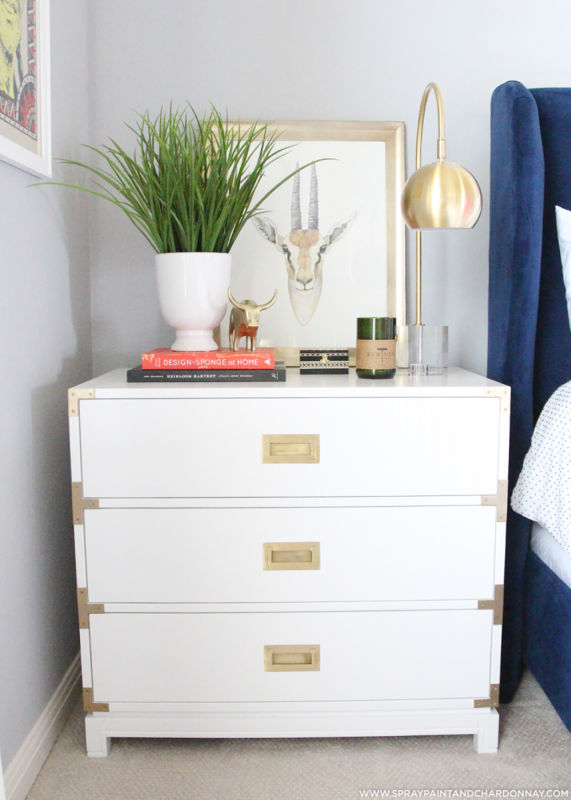 After a week, I replaced all of the brass hardware and moved them to their final destination — the master bedroom! I tried to make the beau’s side a little more masculine, while keeping my side a little more girly and fun, but keeping the same number of elements on each for a balanced look. And that’s it! What do you think?! I’d love to hear your comments! 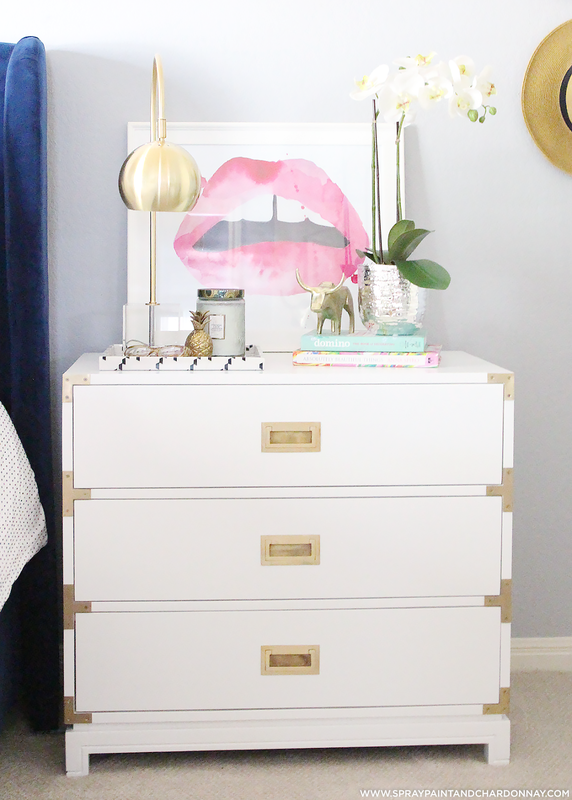 Oh, and stay tuned for an updated full bedroom tour! Hi there! I have been on the lookout for campaign dressers exactly like yours. Your words are literally the same thoughts in my head. But when I go to click on the link of the Ave Home site, it shows the campaign dresser and the “Find A Dealer” button. Once I click on that, I have no idea where to go. Are these dressers even still available? HELPPP! Hi there! And OH NO!!! I just clicked the link as well and it looks like they’re not selling directly from their site anymore (I’m so sorry!) I bet if you reach out to them directly, they can best direct you to a vendor closest to you and help you track one down. I’ve seen VERY similar pieces on Land of Nod’s site, so maybe that’s an option? I’m so incredibly sorry that they’re no longer available to purchase online — I had NO idea! Love these!! What color of Sherwin Williams did you use? In some “New Year” cleaning, I found the paint chip! It’s Sherwin Williams Extra White!